In the current landscape of professional wrestling, women’s wrestling is more prominent than ever before. WWE, ROH, Impact, and the Indies are producing longer matches, better matches, and main event matches. This is becoming the norm instead of the exception. In 2018, one name rose to infinity and beyond. My pick for Wrestler of the Year is Becky Lynch. Becky Lynch is a talented wrestler who consistently puts on strong performances. However, WWE booked Charlotte Flair to be the queen bee of the women’s division. Going into last year’s SummerSlam, inept booking that shoved aside Lynch, in favor of Flair, created a perfect storm of opportunity. Lynch capitalized on it spectacularly to become the most popular wrestler in WWE today. Becky Lynch vs. Ronda Rousey in the main event of WrestleMania is the current marquee match of the industry. Let that sink in for a moment. A subgenre once considered bathroom break fodder is now the apple of everyone’s eye. Most of the wrestlers in the division lack the believability to beat the former UFC champion. Lynch exudes attitude and the requisite authenticity to dethrone Rousey, which makes the match even more intriguing. While the word on the street says the aforementioned match will end up a Triple Threat with the inclusion of Charlotte Flair, Lynch is too popular for the WWE to not only ignore but to not push as the featured attraction. On SmackDown, Becky Lynch got the better of John Cena, who WWE just started marketing as the greatest of all-time. Topping off a fantastic 2018, Lynch had a career-defining match against Charlotte at WWE’s first all women’s pay-per-view event Evolution. Their Last Women Standing encounter has received match of the year accolades and told a gripping story from beginning to end. Lynch was marginalized for the first half of 2018. She capitalized on a creative blunder, which yielded maximum results. 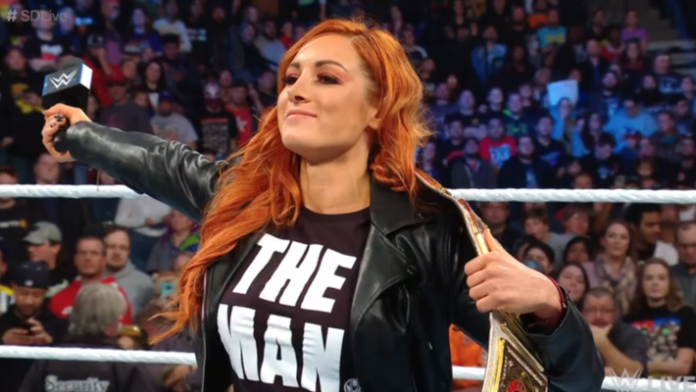 A growing social media presence, match of the year caliber performances, a character people love, a hot selling t-shirt and one-half of the biggest match in the industry gives Becky Lynch the blue ribbon. While other wrestlers such as Kenny Omega, Hiroshi Tanahashi and Seth Rollins are more than worthy of this distinction, Lynch’s story is truly unique, and her impact is undeniable.